Arpoador beach has been where a person have first worn a biquini in Brazil. This has been in 1948 and the author has been a German woman that lived here. 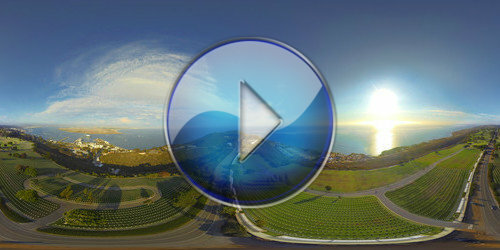 Arpoador is at the left of the immersive picture, looking to the continent. The picture has been made on a big rock that kind of makes the “corner” of Arpoador and Diabo beaches (this last at right). Arpoador beach is only the first 500 meters (0.3 miles) of that beach. Ipanema and Leblon are other names that follows this one beach that the men splited in three. The most traditional golden hour there is the sunset, when the place gets completely crowded. This one has been made early in the morning. Arpoador translates to harpooneer and this name has been given because there, from the rock, it was possible to harpoon wales in a remote past. this is the entrance of the Palace of Versailles, one of the biggest palaces of the world. Surely to show all of it it would be necessary to make hundreds of panoramas. It has 2.153 windows, 67 stairs, 700 rooms, 1.250 fireplaces and 700 acres of gardens. Besides the official site, its wikipedia page can give us a lot of information. One of the main touristic places in the city, the Eiffel Tower is a wonderful engineering artifact built in 1889. Did you know that it is one of the most known structures in the world? It is not by coincidence that you find very long lines under it. According to its page in Wikipedia, it is the most-visited paid monument in the planet. this one is from 2013, more precisely from July when I’ve been to FISL, the International Free Software Forum in Brazil. One of the things that most called the visitors attention was this giant Tesla Coil. The most interesting things about it were that we could receive the electrical discharges from within a Faraday Cage and the discharges produced melodies, like Sweet Child o’ Mine, from Guns n Roses, the National Anthem and others. The forum happens yearly and is already going to its 15th edition now in 2014. It is always at a university in Porto Alegre, south of Brazil. At the panorama below you will be able to watch the video in part of it, but only in FLASH devices. Unfortunately I was not able until now to enable it for HTML5 devices like Apple ones (iPod, iPad, iPhone, …). I had published an external panorama of the same place before and also a small online video of it playing our national anthem. 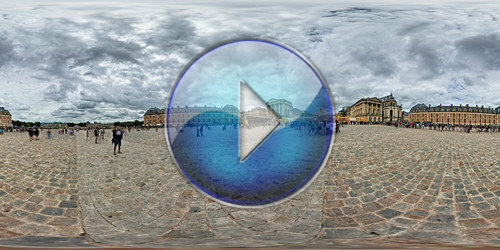 The challenge here has been to put the partial video stitched with the panorama. Until now I was not able to do that with Apple devices, but I think it is possible. The problem is that sometimes you spend so much time on something that you better realize that the optimal might be enemy of the good, so, after many months I realized that maybe I could never publish this panorama if I waited to achieve that. These pictures were shot at Point Loma, a hilly peninsula that is bordered on the west and south by the Pacific Ocean, the east by the San Diego Bay and Old Town and the north by the San Diego River. The time of the shot was good for the picture of the sun, but unfortunately I couldn’t visit the Cabrillo National Monument as it was already closed. I went there with a friend met at a conference I was participating in the city. He suggested me the place. Then we stopped in this place, which gave me a very peaceful sensation. Although it might look morbid, I try to face things naturally. I believe oriental people do that more than occidental. The Fort Rosecrans National Cemetery is a federal military cemetery where are interred soldiers died in battles, wars and accidents since 1846 until the World War II. As the place is a little far from downtown (about 10 miles) the peace feeling was great. It has very few people and we could basically stare the nature, the sky and the view around. This song has been sang by Frank Sinatra (with Tom Jobim in this video) and others around the world. 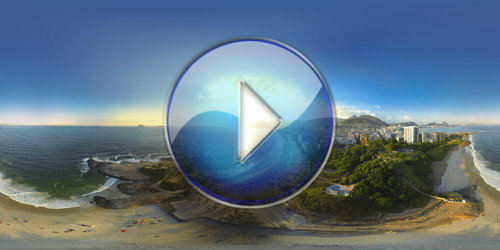 Shown above is a small part of the original “Garota de Ipanema” (The Girl from Ipanema), a music composed by Tom Jobim and Vinícius de Moraes. The Portuguese version in the panorama is sang by Toquinho and Vinícius, recorded in 1975. 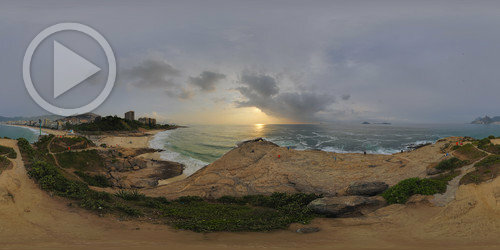 Ipanema is a very inspiring place, and right at its corner is Arpoador. There is no physical delimiter between them. The neighborhood, the beach, always full of young and beautiful people, inspired Vinicius de Moraes, Tom Jobim and many other lovers since no one knows when. 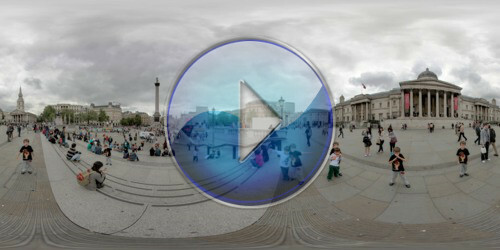 The Trafalgar Square is a very frequent destiny for the tourist that goes to London. At its centre is Nelson’s Column, which is guarded by four lion statues at its base, among other commemorative statue and sculptures in the square. The name commemorates the Battle of Trafalgar, a British naval victory of the Napoleonic Wars over France which took place on 21 October 1805. The present architecture of the square was completed in 1845. I’ve been there in 2012, 18 days before the Olympic Games and 51 before the Paralympics. The place invites us to stop a little and watch the people that pass by and the architecture around. The National Gallery is just a few steps from the lions. Founded in 1824 it is one of the most important museums in Europe and one of the most known around the world. It houses a collection of over 2,300 paintings dating from the mid-13th century to 1900 and entry to the main collection is free of charge. To make this picture I’ve made 3 expositions using Magic Lantern firmware, but at the end I’ve used only one of them. Multiple exposition in a scene with movement is always painful. I decided to generate different expositions from one original, so making a pseudo multiple exposition to increase a little the dynamic range.